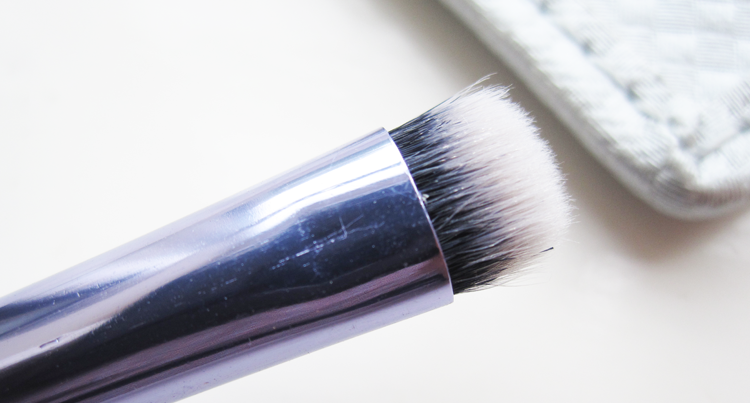 When it comes to shopping for great quality, stylish and affordable makeup brushes, you'll be hard pressed to find anything that ticks all of those boxes quite like Real Techniques does. Their Limited Edition Eyelining Set is a welcome addition to my brush collection. Whether you're into adding a little subtle definition to your eyes or love a full on classic feline flick, the Pixiwoo ladies have come up trumps with this fab set of four exclusive brushes. Each one of these brushes has been especially created to help you easily acheive your desired eyeliner look. 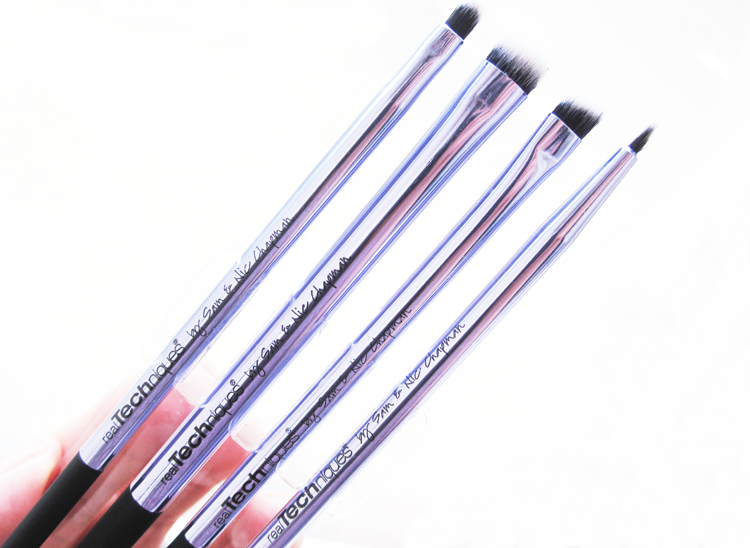 Like all Real Techniques brushes, these are also made from high quality synthehic bristles making them cruelty free, and the bristles feel soft, yet sturdy. I've used RT brushes since they first came out and they wash beautifully, dry quicker than other brands and I've yet to experience any shedding issues. The handles are slim and leightweight so easy to hold, and look unashamedly contemporary and on trend in their shiny metallic glory. So damn pretty! The Pointed Liner Brush is one of those multi-purpose brushes that you'll find yourself reaching for again and again and wishing you had two of! It has a flat, tapered head and can be used to create both thick and thin lines. I find this works especially well with gel liner formulas, and you can also use this brush for lips, brows (again brow gel formulas are great with this) and for spot concealing. Self-explanatory really, but one that I didn't want to just skip by. It has a short, dense, but soft head for blurring and smudging eyeshadow around the eyes for a gorgeous smoky look. Use it to add some black eyeshadow along the bottom lashline for lots of instant rock chick drama. If you struggle with getting your cat eyed flick on point, this is the brush to pick up as it does most of the work for you. Just dip into your desired liner formula (again gel works great with it as does powder and liquid), line up the flat angled side to the outer corner of your eye and slick it on. The bristles are sharply cut at the edges to give you a pro finish. Last but not least, we have the Precision Liner Brush which is a must for anyone who wants that coveted super straight, absolutely perfect line. As you can see, the head of this is much smaller and much more tapered to a point than the Pointed Liner Brush so you can acheive both thin and thicker lines but with more control. 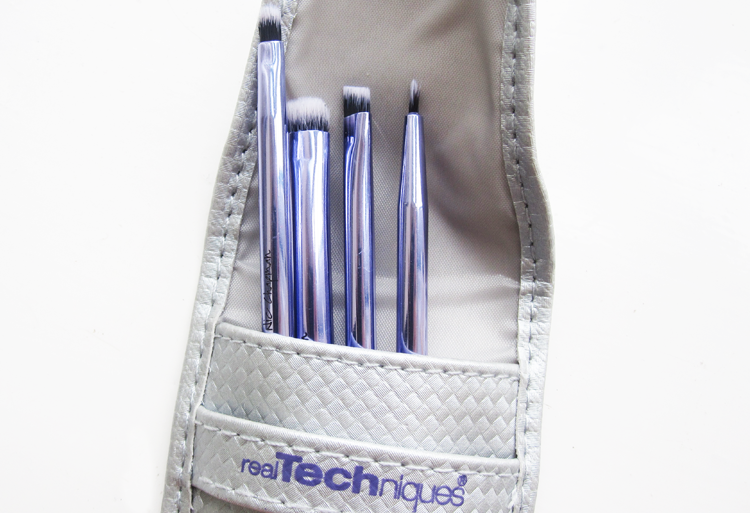 This set comes complete with a handy metallic pouch that you can use to pop your brushes in whilst travelling, or to keep them dust free and tidy when they're not in use. 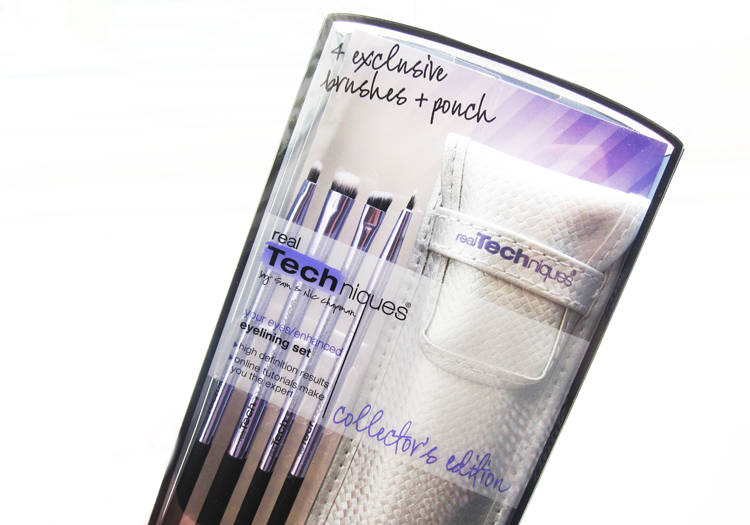 The Collector's Edition Eyelining Set retails for around £19.99 so each brush comes in at less than a fiver which is great value considering how much you can spend on individual brushes these days. As always, the quality of this Real Techniques set is brilliant! 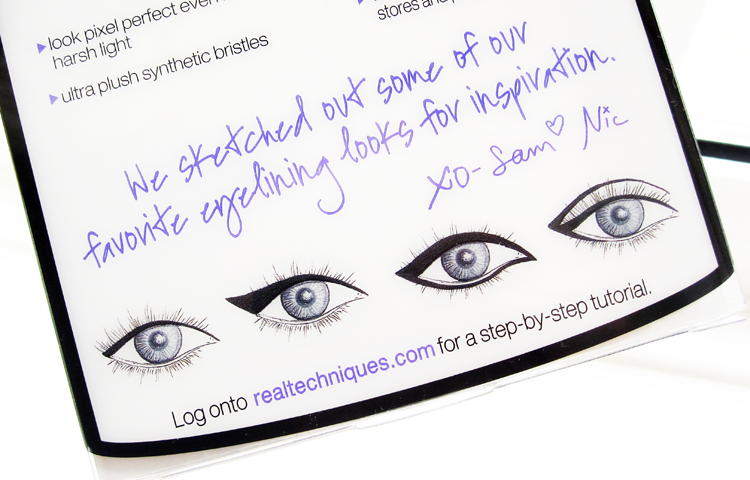 Check out my previous reviews of Real Techniques brushes here! Are you a fan of Real Techniques?